It's been a while. 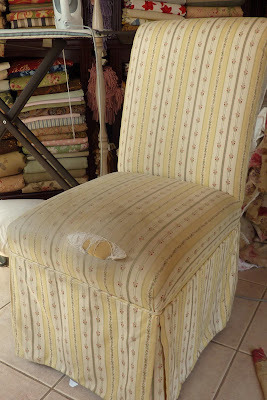 Though I haven't been posting lately, I've been busy working in the cottage on some fabulous things. I've been taking pictures as I go, waiting until I can post the results. 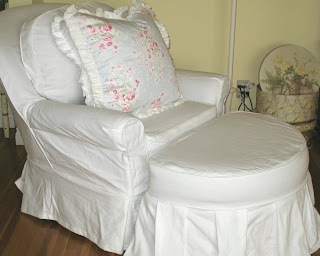 I just finished an adorable slipcover for a parsons chair and wanted to share the pics. 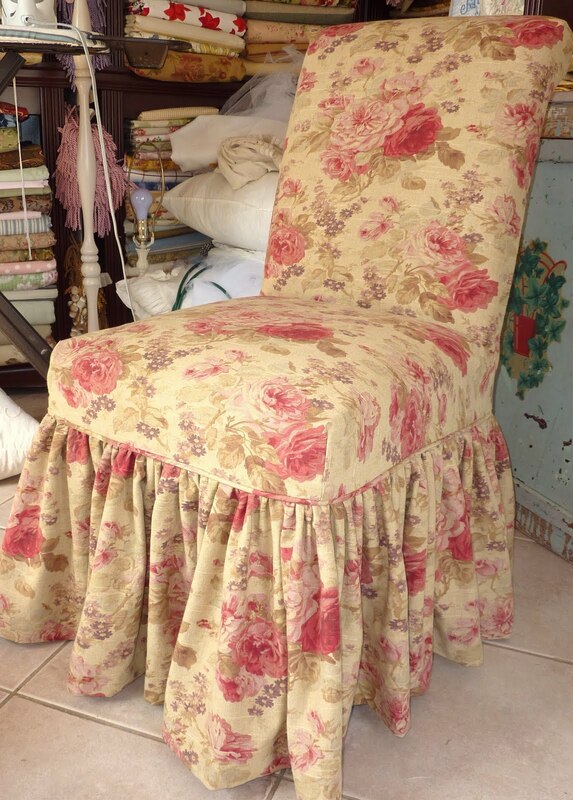 cabbage roses on tea stained background with a gathered skirt! keeping a house pristine when there's living to do? I'd be happy to make it for you. 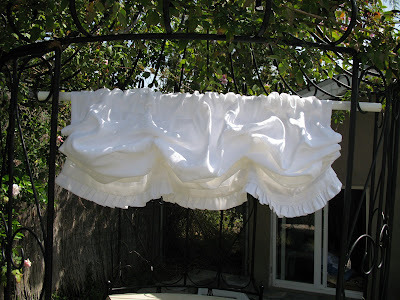 a pleated skirt. Super fun! 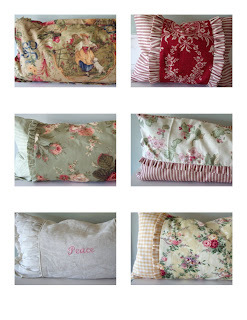 My sister Connie asked me to make some bedding for her master bedroom. 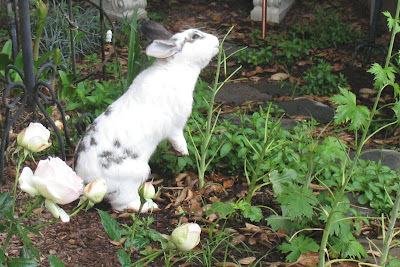 She and her husband Jim have three little ones and wanted a sanctuary that would be light, airy, and soothing. 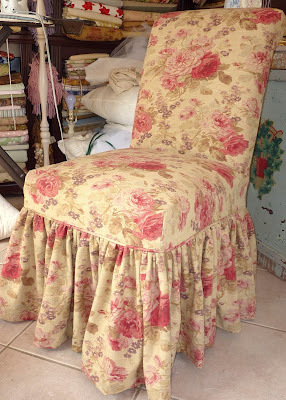 After showing her some pictures of the floral fabrics of Pine Cone Hill bedding, she gave the OK for me to go ahead and surprise them. Now that she has a blank canvas...the fun stuff comes next. Her palette of colors was based on a solid linen. She asked for a blue color that "looked like Dad's oxford cloth shirts." To that, we added a beautiful rose print with a pale blue background to pull in the feeling of the bedding from Pine Cone Hill. Add to that generous amounts of pure white and we were set. 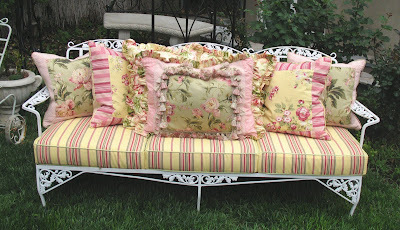 The picture below is of the 3 extra large square pillows. 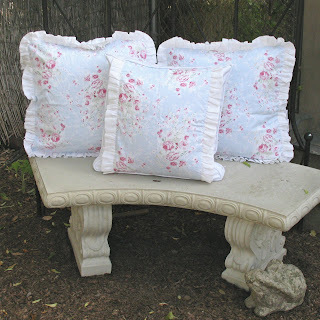 They feature lots of ruffles in white and a soft poplin print of cabbage roses on a pale blue background. They are constructed with three sides and a zipper opening for easy removal. 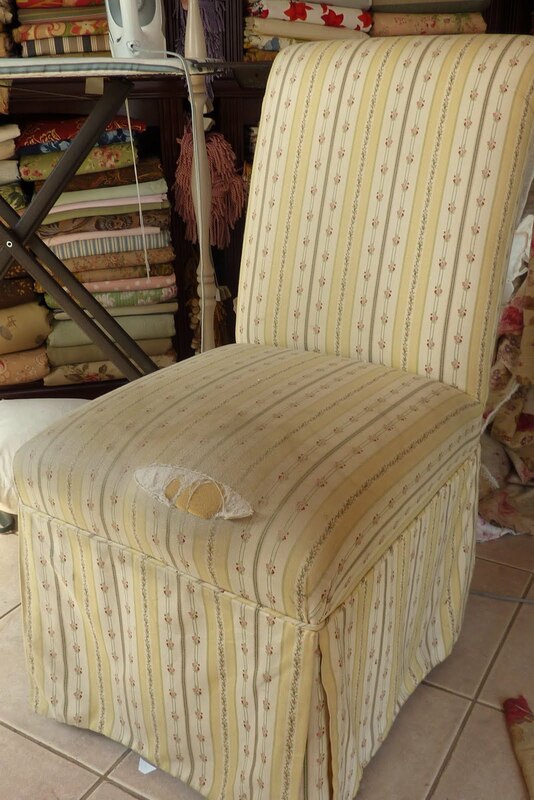 All seams are overlocked. The next image is the two king-size pillows that will go in front of the above set. 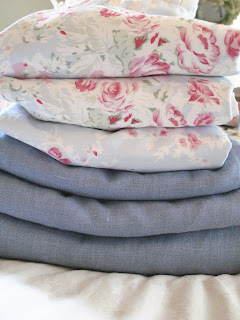 They are made with 100% pure linen in a gorgeous soft blue. 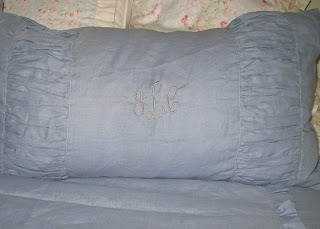 Although they are made of only one fabric, the details of rouching, top stitching, and embroidered monogram give these pillows an understated elegance. 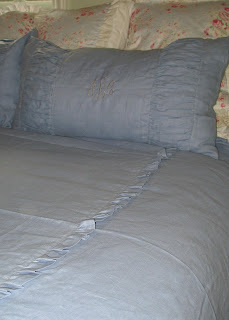 Notice the detail on the duvet cover of the repeating ruffles. Hey there everyone! 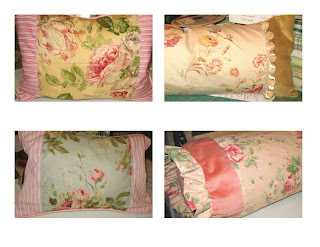 Just wanted to add some pictures of pillows I've been working on to give you some ideas about what can be made. I have a TON of fabrics that I've collected over the last 5 or so years. 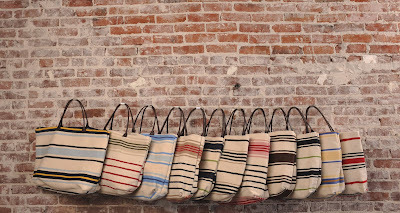 If you are looking for a certain color, style, size, etc. , give me a call and we can come up with something original that works for you.